My family took the holidays very seriously growing up. Our celebrations were steeped in artful family tradition, especially during the winter. That is why we've looked forward to this Kinfolk December Workshop most of all! Harvesting from nature while combining those old world traditions with treasured favorites, not only makes the season more personal, but also unique to you! Who better to show you the art of wreath making than my professional wreath making sister Victoria Wanberg, whose taken her passion to an art form. She owned her own business, Withers & Vilm, where she handcrafted floral wreaths and bouquets for various clients, including Williams-Sonoma and Smith & Hawken. Initially working with dry florals, her styling soon broadened into all things visual, including interior design, displays, models, and props. Victoria continues to work as a freelance stylist either on-location or in her backyard Rose Cottage, designing handcrafted custom floral pieces. My sister is sure to inspire you as much as she's inspired me! As we close the season of Kinfolk community gatherings this weekend, we'd love to welcome you to our home to toast an amazing year with all of you and share in some cozy holiday cheer. 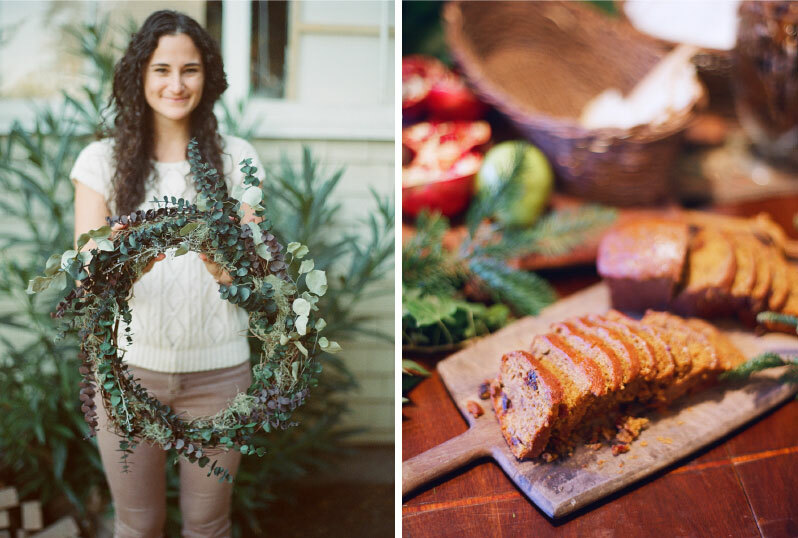 We are excited to introduce a lovely friend of ours, Chef Ashley Mulligan-Schultz, for this month's Natural Home and Holiday Decor Workshop. Ashley has been working as a personal chef abroad for two years, taking her all over the globe collecting exotic spices, flavors and recipes from each region. Her talent for baking while incorporating wholesome ingredients and unique spices made her the obvious pick for our holiday fare. Taking treasured old holiday recipes and giving them an artful twist offers up a treat for the pallet! Can't wait to taste the sweet treats and savory goodies she's putting together for us. 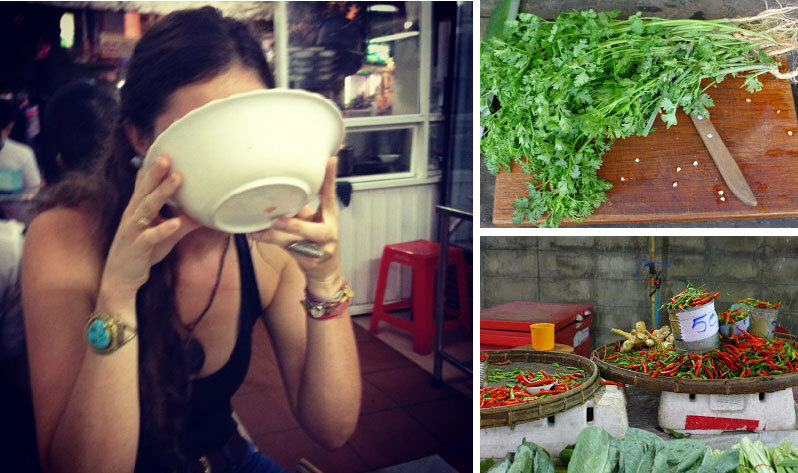 Check out the amazing places she's been in her blog, A Gypsy Chef. Our last gathering of 2013 is on Saturday, December 14, 1-4pm. Tickets are $45 and are available at Kinfolk. Don't miss it! Tickets are now available at Kinfolk for our final gathering of 2013, Holiday Decor! Get in the holiday spirit by wreath-making with floral designer, Victoria Wanberg, formerly of Williams-Sonoma and Smith & Hawken! Create wreaths and tree decor using materials found in nature. Spiced cider, mulled wines and desserts to follow, all created by Chef Ashley Mulligan. It all happens Saturday, December 14, from 1:00 - 4:00 in the afternoon, in an old Victorian home in downtown Santa Barbara. Tickets are $45, and are limited, so don't delay! Thanks to all who came out last month to our Kinfolk event at Municipal Winemakers . Local photographer Chelsea Mitchell took some amazing photos... make sure to check out our gallery page. Gorgeous! Thanks again to Nancy Salvucci and SB Digs for the great recap of the evening. Fruitful Collaborations will be back in December to host the last of the 2013 Kinfolk Gatherings in Santa Barbara... Home Decor! Make sure you're on our email list so you'll be alerted as soon as tickets are available. Check out these hand printed covers for the recipe books we'll be creating on Sunday at "Gathering at the Kinfolk Table." Contribute your family recipe by this Saturday, and it will be included inside these lovely books everyone will make and take home. October's Kinfolk Cookbook Workshop is centered around tradition. Passed down treasured recipes from one generation to the next... so it seems especially appropriate to present Emma Cantu as our featured impassioned cook! A woman whose passion for cooking is poured into every bite. A staple at the Santa Barbara's Farmers Market for many years, you can always catch her there feeding the vendors her latest artful recipes. From hot and savory delectables to her famous cakes made from scratch! But whenever asked to cook on a grand scale, Emma earnestly says "I only cook for friends who come into my heart". So it is with that in mind I feel especially honored to share our beloved Emma's feast with recipes she collected over thirty years as a gourmet cook. You're in for a meal you won't forget with flavors both unique and comforting... So hope you can join us! Yellow 108 is a Los Angeles based headwear, sunglass, and lifestyle goods company specializing in products made solely from salvaged materials. We don't create new waste when we make our products and we're completely dedicated to living lives of purpose through our goods, our work, and our community. As artists on mission driven lives, we develop products that help us find joy and happiness without sacrificing fashion, function, quality, style, and design. Enjoy your journey, we hope you take us everywhere. Yellow Love. Yellow 108 is also a sponsor for our next Kinfolk gathering! They have graciously donated their gorgeous napkins and aprons for use at the dinner... adding such a beautiful simplicity to the entire evening. Get over to their website and check out all of their products. Yellow love, indeed! This month's event, "Gathering at the Kinfolk Table", is taking place at Municipal Winemakers, housed in the hippest part of Santa Barbara. One block from the beach and one block from State Street, The Funk Zone has become the heart of what's happening in our coastal town. What started out as a few galleries and wineries nestled between industrial warehouses and workspaces has quickly become a haven for artists, wine connoisseurs, musicians, and foodies. Home to the Urban Wine Trail, the Funk Zone now offers more than twenty venues for sipping from the vine, as well as new culinary hot-spots The Lark and The Lucky Penny. The Funk Zone now offers more for beer drinkers with the opening of Figueroa Mountain Brewery, and those that are musically inclined can test drive the latest models at The Guitar Bar. Aside from food and wine, the Zone shelters many businesses and galleries, like The Arts Fund, which supports local and emerging artists and whose infamous Teen Arts Mentorship Program fosters a new generation of artists. To best peruse this newly-burgeoning area, start at Municipal Winemakers and sample their excellent Pinot Noir while you partake in a game of backgammon. Follow your victory with a stroll through the area, checking out galleries and live music along the way. End your evening with a great meal from one of the local establishments, or perhaps eat standing up, with an equally amazing meal from one of the tasty food trucks that roam the streets. 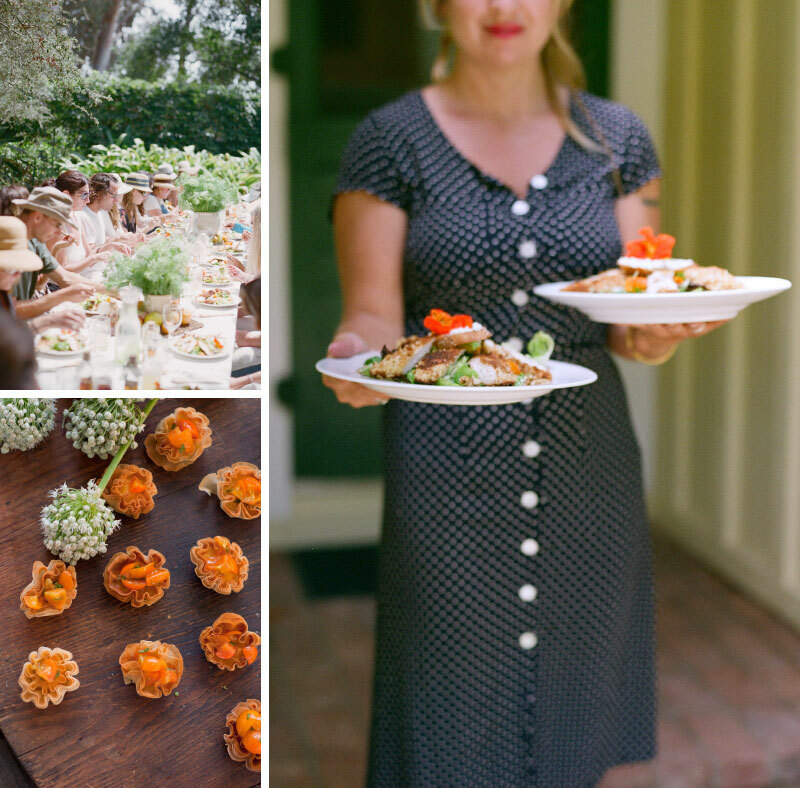 SB Digs, Santa Barbara's guide to what's going on in home and garden, has again featured our latest Kinfolk Gathering, Preserving the Season! Check it out! SB Digs has been a great partner with us from the beginning, helping get the word out for these great Kinfolk events. A big thanks to their whole team!! Kinfolk's Preserving the Season workshop is this Sunday, and we're excited to announce that local photographer Natalie Thomson will be working with us! Natalie is originally from Scotland and moved to the states at age 11, and currently resides in Santa Barbara. She completed a Professional Photography degree at Brooks Institute in 2005 with a major in Product Photography. Natalie has lived in Los Angeles and Santa Barbara shooting many different types of photography such as celebrity events and product photography, but mostly concentrates on weddings and family portraits. Check out Natalie's blog... gorgeous! We're super excited about the venue for our upcoming Kinfolk event. This beautiful Art and Crafts inspired home in the Santa Barbara hills was designed and built by Nathan Modissette, owner of BoMo Design. BoMo, short for Bohemian Modern, is a full service builder merged with an artisan workshop. With an emphasis on local, handmade, custom finish and furniture; BoMo couples clean, essential design with sustainable, innovative building techniques. What a great opportunity to see one of their designs up close! We met Julia Crookston, Chef-owner of Goodland Kitchen, out at Lake Cachuma last month as a guest at our August Kinfolk Workshop. We talked about food, her cafe in Goleta, and of course, canning! What a lucky break. We approached her the very next week, and were thrilled to learn she would join our team for the next Kinfolk community gathering in Santa Barbara, "Preserving the Season." Who better to teach us a bit about putting up the season's bounty than this expert of jamming and pickling? Not only will she show us how to make Moroccan Lemon Preserves, but she's putting together a inspired lunch utilizing those lemons, as well as some other preserved delectables… all locally sourced, and homemade, or course. If you haven't been to Goodland Kitchen, you're in for a treat. They are dedicated to local agriculture, sustainability, and delicious food produced on a community scale. So, be sure to get over to Goodland Kitchen, and hope to see you at the next Kinfolk Workshop on Sept 29! Thanks to all who came out to Lake Cachuma! We had such an amazing time out at Lake Cachuma! Great food… great wine… great people! And those s'mores! I can't stop thinking about them… gooey and delicious. Thanks again to Municipal Winemakers, Chef Kim Schiffer, and The Kinds for making the event so fabulous. And, a special thanks to our photographer, Chelsea Mitchell. Once again, she captured the afternoon with her beautiful photos. Head over to our gallery page and have a look. Next up… Preserving the Season on September 29th! Tickets go on sale on Kinfolk later this week, so stay tuned! Kinfolk Magazine event series in Santa Barbara is proud to announce that The Kinds will be playing Fireside Theater at Lake Cachuma campground for our afternoon entertainment!! Woohoo!! Workshop theme: A lesson on camp cooking and grilling. Make gourmet s'mores, camp cookout with local Chef Kim Schiffer, wine pairing from Santa Barbara's own Municipal Winemakers. Tickets are $35, and are limited. Visit kinfolk magazine today and get 'em while they last! A bit about the band.... The Kinds is a local, Santa Barbara, 4 piece band. Defined by original songs, strong female vocals, dynamic harmonies and a good time. The Kinds forge a blend of folk rock with rootsy acoustics. Have a listen! We are honored to announce Municipal Winemakers as our wine sponsor for our August 24th event, The Art of Camp Cooking. Winemaker Dave Potter will artfully pair his vintages with chef Kim Schiffer's fireside lunch. Known as much for their laid back, community vibe as for their delicious, unpretentious wines, Municipal is the perfect complement for this month's Kinfolk gathering. Check out this video to learn more about Municipal, or sip and see for yourself at their eclectic tasting room, located in Santa Barbara's hip Funk Zone. Kinfolk Honey Harvest, That's a Wrap! Had a lovely time out at Heart Stone Ranch in Carpinteria last weekend. 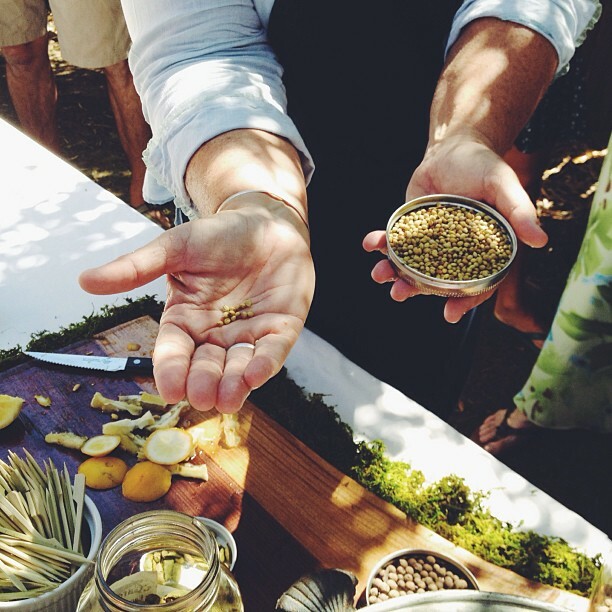 Our Kinfolk Honey Harvest workshop was so much fun! We learned about bees from Nick and Tom of the Santa Barbara Bee Association, created honey infusions, and had an amazing honey inspired lunch by Kim Schiffer. It was all captured by local photographer extraordinaire, Chelsea Mitchell! Check out her beautiful photos on our gallery page. Thanks to all who joined us for a lovely afternoon!! Farmer's Market, Here We Come! Now is your chance! Ticket sales for our Honey Harvest event are now available through Kinfok. Tickets are limited to 25, so don't wait... we'll see you out at Heart Stone Ranch on Saturday, July 13.